How do I know my child is getting enough flouride? How will our doctors help my child feel comfortable? Do I accompany my child into the treatment area? How can parents prepare their child for their dental visit? The primary teeth begin their development very early in the unborn child’s development. On average the lower incisors begin to erupt 6 to 8 months after birth. All twenty baby teeth usually have come in by 2 ½ and 3 years of age. The eruption order of the baby teeth can be variable and a parent should not worry. The primary teeth are of major importance to the child's appearance, chewing ability, and eventual health of his or her permanent teeth. The first permanent molars, usually called the 6 year molars erupt behind the last baby molars any time between 5 and as late as 9 years of age. They are sometimes mistaken as baby molars since they do not replace any baby teeth. At about the same time the lower adult incisors begin to come in and are usually followed by the upper adult central incisors and lateral lower incisors. Eruption of the rest of the incisors, cuspids, bicuspids and second molars continue to 12 to 13 years of age. Wisdom teeth erupt around 17 to 21 years of age. The sooner the better! Starting soon after birth, clean your child's gums with a soft infant toothbrush and water. Remember that most small children do not have the ability to brush their teeth effectively. When the baby teeth start to erupt into the mouth an amount equal to a grain of rice of fluoride containing tooth paste should be applied to the brush and the child allowed to play with the brush in the mouth. The child should be encouraged to spit out and then the teeth and gums are brushed by an adult with just a wet tooth brush. "First visit by first birthday" sums it up. Your child should visit Dr. Elliott A. Schwartz when the first tooth comes in, usually between six and twelve months of age. Early examination and preventive care will protect your child's smile now and in the future. The most important reason is to begin a thorough prevention program. Dental problems can begin early. 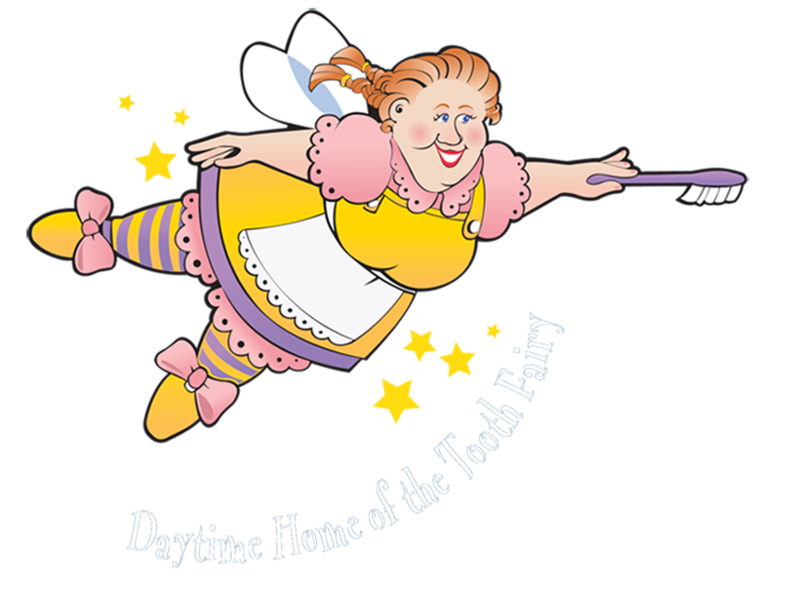 A big concern is Early Childhood Caries (also know as baby bottle tooth decay or nursing caries). Your child risks severe decay from using a bottle during naps or at night or when they nurse continuously from the breast. The earlier the dental visit, the better the chance of preventing dental problems. Children with healthy teeth chew food easily, learn to speak clearly, and smile with confidence. Start your child now on a lifetime of good dental habits. From six months to age 3, your child may have sore gums when teeth erupt. Primary care for teething is to clean the teeth and gums with either a wet soft tooth brush, wet wash cloth or a clean finger. Many children like a clean chilled teething ring, cool spoon, or cold wet washcloth. Primary, or "baby," teeth are important for many reasons. Not only do they help children speak clearly and chew naturally, they also aid in forming a path that permanent teeth can follow when they are ready to erupt. It is very important that primary teeth are kept in place until they are lost naturally. These teeth serve a number of critical functions. First, rinse the irritated area with warm salt water and place a cold compress on the face if it is swollen. Give the child acetaminophen for any pain. Call Dr. Elliott A. Schwartz and visit the office promptly. Do not put heat or aspirin on the sore area. Thumb sucking is perfectly normal for infants; most stop by age 2. If your child does not, discourage it after age 4. Prolonged thumb sucking can create crowded, crooked teeth, or bite problems. Thumb and pacifier sucking habits will generally only become a problem if they go on for a very long period of time. Most children stop these habits on their own, but if they are still sucking their thumbs or fingers when the permanent teeth arrive, a mouth appliance may be recommended by Dr. Elliott A. Schwartz. Parents become aware that their child is grinding their teeth from the noise while the child is sleeping or from the shortened appearance of the teeth. Causes can be stress from changes in regular habits, school or family stress or physical such as a larger than average tooth or teeth and mismatched jaw sizes. In a young child, teeth grinding due to larger than average tooth size can be treated. I reshape the larger tooth to match the rest of the dentition. Mismatched jaws can be treated at puberty with braces and emotional stress factors are beyond the scope of my practice. Most children outgrow tooth grinding around 6 to 9 years of age as the permanent dentition develop and this habit usually stops by 12 years of age when all the baby teeth are lost. Encourage your child to drink from a cup as they approach their first birthday. Avoid nursing children to sleep or putting anything other than water in their bed-time bottle Children should not fall asleep with a bottle. At-will nighttime breast-feeding should be avoided after the first primary (baby) teeth begin to erupt. Drinking juice from a bottle should be avoided. When juice is offered, it should be in a cup, and only with a meal. Also, learn the proper way to brush and floss your child's teeth. Take your child to a pediatric dentist regularly to have his/her teeth and gums checked. The first dental visit should be scheduled by your child's first birthday. A check-up every six months is recommended in order prevent cavities and other dental problems. However, Dr. Elliott A. Schwartz can tell you when and how often your child should visit based on their personal oral health. An amount equal to a grain of rice of adult strength fluoridated toothpaste on the brush should be introduced when the baby teeth start erupting into the mouth.Prior to that, parents should clean the child's teeth with water and a soft-bristled toothbrush. When toothpaste is used, parents should supervise the child's brushing and make sure the child uses no more than a pea-sized amount on the brush. Children should spit out and not swallow excess toothpaste after brushing. Make sure your child has a balanced diet, including one serving each of: fruits and vegetables, breads and cereals, milk and dairy products, and meat fish and eggs. Limiting the servings of sugars and starches will also aid in protecting your child's teeth from decay. You can also ask Dr. Elliott A. Schwartz to help you select foods that protect your children's teeth. Have Dr. Elliott A. Schwartz evaluate the fluoride level of your child's primary source of drinking water. If your child is not getting enough fluoride internally through water (especially if the fluoride level is deficient or if your child drinks bottled water without fluoride), then Dr. Elliott A. Schwartz may prescribe fluoride supplements. Soft plastic mouthguards can be used to protect a child's teeth, lips, cheeks and gums from sport related injuries. You can select from several options in mouth guards. Preformed or "boil-to-fit" mouth guards are found in sports stores. Different types and brands vary in terms of comfort, protection, and cost. A custom-fitted mouthguard developed by Dr. Elliott A. Schwartz will protect your child from injuries to the teeth, face and even provide protection from severe injuries to the head. They cost a bit more, but are more comfortable and more effective in preventing injuries. Dr. Elliott A. Schwartz can advise you on what type of mouth guard is best for your child. The most important thing to do is to remain calm. Find the tooth and rinse it gently in cool water. (Do not scrub it or clean it with soap -- use just water!) If possible, replace the tooth in the socket and hold it there with clean gauze or a wash cloth. If you can't put the tooth back in the socket, place the tooth in a clean container with the child's spit. Get to Dr. Elliott A. Schwartz's office immediately. (Call the emergency number if it's after hours.) The faster you act, the better your chances of saving the tooth. There is very little risk in dental X-rays. Dr. Elliott A. Schwartz is especially careful to limit the amount of radiation to which children are exposed. Lead aprons and digital sensors are used to ensure safety and minimize the amount of radiation. The first appointment is usually a "Get to Know" our new patient and their parent. We begin with a thorough review of the Medical History, perform an Oral Examination and when possible an appropriate X-Ray Examination. Dr. Elliott A. Schwartz or Dr. Enkeleda Thaci will discuss with you the oral condition of your child and recommend only necessary treatment. You will be given information so that you can make an educated choice of treatment and the various filling materials that we use. We will also discuss with you whether the treatment can be done in our office or should be done at North York General Hospital while your child is administered a general anaesthetic. If the first appointment is an emergency we will try and get your child out of pain and do only treatment that is absolutely necessary. If time permits a comprehensive treatment plan will be discussed and a treatment plan and estimate provided to you. There are many methods to help make your child comfortable with dental treatment. Our doctors and staff utilize the "tell-Show-do" technique which is very effective for children. Coaching, distraction (televisions in the ceiling), open concept for patient modelling, and parent participation are other possibilities to give your child confidence in dentistry. If the dental work is extensive or the child is below the age of cooperation a general anaesthetic will be recommended so that your child has a fresh start on the road to dental health. If the treatment is to be done in our dental office the use of Nitrous Oxide (laughing Gas) and the no needle laser will also help to keep your child calm during filling appointments. Infants and children under the age of 3 years are accompanied by a parent for most visits. For children older than 3 a parent may stay with the child and hold their hands or make physical contact with an arm or leg. We ask you to be silent when accompanying children over 3 years so that our doctors and staff can build a rapport with you son/or daughter. Studies and our own experience have shown that some children respond better when they experience the dental visit on their own. If you are asked to leave the treatment area we expect you to co-operate. Our job is to help your child get through their dental procedures as quickly and pleasantly as possible. Almost every child asks for his/her parent, so we anticipate this question. This is best handled with the use of distraction techniques. When a child asks for his/her parent, we tell them that mommy or daddy is waiting in the waiting room and will be so proud of him/her once he/she are finished. Tell your child about their upcoming visit to the dentist. Explain to your child that the dentist is here to help them have heathy teeth and gums. There are many excellent books written on going to the dentist and these may help to prepare your son/daughter. If you are positive and enthusiastic about your child's upcoming visit you will alloy your child to be calm and look forward to his/her appointment.